Graphic designers need a display that has a high resolution, delivers great performance, and is equipped with connectivity options that are up to date. If you are professional graphic designer or pursing your studies to be professional, you can’t simply wander around the corner and simply buy a monitor. Graphic designing works involve high level of accuracy in terms of color reproduction and performance. 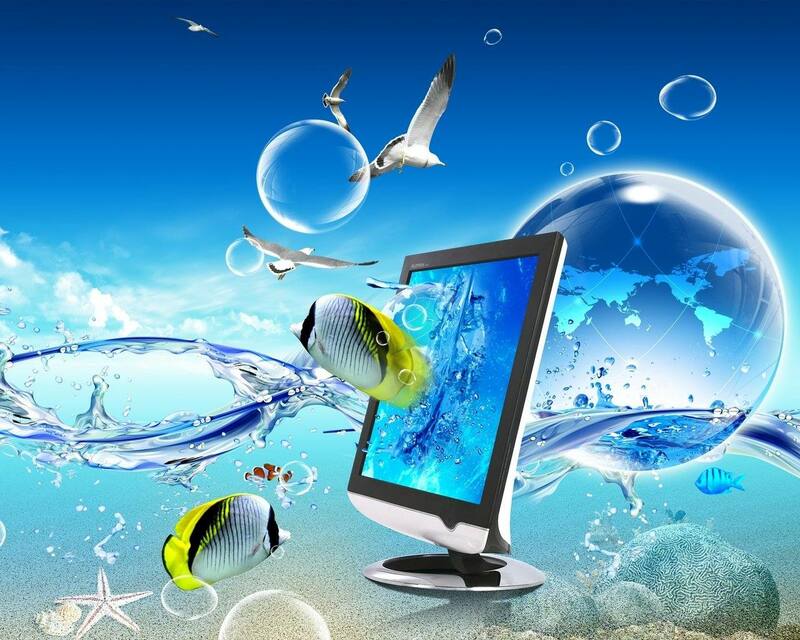 You will need a computer monitor that can excellently perform, has outstanding color accuracy and is compatible with wide range of computer peripherals. So lets us explain why you should focus on following specs while buying ideal graphic design monitors. You will be using many graphic design software like coral draw, serif DrawPLus, adobe Photoshop, Xara and so on. 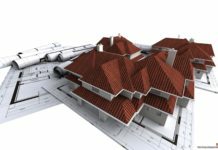 You know that the tool bar of these software will take significant real estate of your monitor and also you will be rendering the image in ultra high resolution. It is always betters to have more than less. So, we recommend getting monitor size of 27 inch. Also you will have enough room to work on multiple projects at the same time. If you have budget for it, getting QHD monitor will be best thing to do. Twisted Nematic (TN) Panel is pretty outdated technology. With the color reproduction limiting to only 262 thousand colors, a graphic designer might find it inferior to latest In-Plane Switching (IPS). IPS panel have 8, 10, 12 or 14-bit look-up table (LUT) with color reproduction ranging from 16.7 million to 1.7 billion. Hence, for graphic designing monitor we recommend choosing high-end IPS panel like Advanced High Performance In-plane switching (AH-IPS) with at least 10-bit LUT. Any standard color gamut monitor will cover 100 percent of sRGB while a wide color gamut monitor has 99 to 100 percent of Adobe RGB. So, what are the main differences? Like in the picture above, a wide color gamut will cover wide range in the color spectrum. 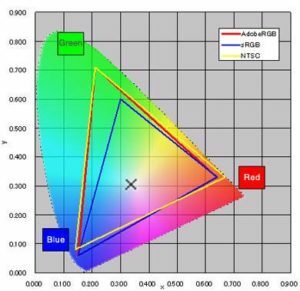 Hence, if your job demands high level of accuracy, you should buy a computer monitor with wide color gamut. But keep in mind this type of monitor will cost you high prices. For the graphic design students we think a decent standard gamut monitor will be fine. 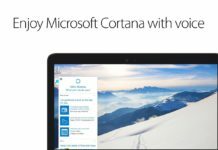 You will be connecting your monitor with wide range of devices so, make sure it covers all the standards. By standards we mean a HDMI port, USB 3.0 ports, Display Port 1.2, and dual-link DVI ports. Also a model with thunderbolt ports can help you save money in future. 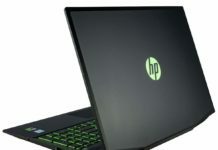 HP 27sv 27-Inch is 27-Inch Widescreen LED flat-panel, bezel-less monitor. The display has a maximum High Definition screen resolution of 1920 by 1080 pixels for brilliant views of quality images on the screen. The screen is integrated with IPS technology, which offers graphic designers an edge-to-edge view of the graphics designed to deliver a clear, and a crisp view from a wide variety of angles. The screen supports a display of images at 178 degree angle of view. Moreover, the monitor possesses a screen brightness of 250 cd/m², and an aspect ratio of 16:9. The display also has a typical contrast ratio of 1000:1, and a dynamic contrast ratio of 10,000,000:1 which enables it to deliver detailed, and sharp pictures with remarkable clarity. Further, the display has an ultra fast response time of 7 milliseconds which enables the screen to deliver sharp, fast-action pictures to avoid streaking or blurring. The monitor supports input/output connectivity through the following ports: HDMI, DVI-D, VGA, and speaker ports. The ports enable graphic designers quickly connect secondary devices on their displays with simplicity, and offers easy access to all the available ports. Dell Ultrasharp U2417HJ is a full High Definition 23.8” screen Liquid Crystal Display monitor that comes along with a stylish charging stand that is wireless to charge PMA or Qi-enabled smart phones. The monitor has a stunning design and offers strong performance to graphic designers. The Ultrasharp U2417HJ has a wide screen with an aspect ratio of 16:10, and an optimal screen resolution of 1920 by 1200 pixels with a refresh rate of 60 Hz. Additionally, the monitor has a response time of 8 milliseconds and provides graphic designers with a superb level color accuracy as it supports 16.78M colors. The Dell Ultrasharp U2417HJ monitor supports In-Plane Switching which is anti-glare and has a hard coat 3H. This provides graphic designers with a maximum viewing angle of 178º while handling their projects, creating a display that is more appealing in appearance. Regarding connectivity, the monitor supports one DisplayPort, one USB 2.0 upstream port, one Video Graphics Array, one Digital Visual Interface connectors which come along with HDCP, one DC power connector used to control Dell Soundbar, and four USB 2.0 downstream ports. These ports enable graphic designers to easily connect all their secondary devices in a most convenient way. These features make the Dell Ultrasharp U2417HJ the best monitor for graphic design. ASUS PB279Q 27″ 4K/UHD is a flicker free 27-inch LCD widescreen monitor. The monitor has an Ultra-High Definition screen resolution of 3840 by 2160 pixels, with a pixel pitch of 0.155 millimeters. The HDMI port has a true resolution of 3840 by 2160 pixels with a refresh rate of 30Hz, while the DisplayPort has an optimal screen resolution of 3840 by 2160 pixels operating at 60Hz refresh rate. Additionally, the monitor also has a maximum contrast ratio of 1000:1, and a response time of 5 milliseconds. The ASUS PB279Q 27″ 4K/UHD supports 1.07 billion display colors and a color saturation of one hundred percent sRGB providing graphic designers with the great detailed view of their artworks. This also enables graphic designers to be able to perform calibrations frequently. Furthermore, the LCD monitor of the ASUS supports IPS, providing a wide-viewing angle of 178 degrees to graphic designers, and excellent color accuracy. Putting connectivity into consideration, the monitor supports Mini DisplayPort 1.2, DisplayPort, and four HDMI/MHL ports as its signal input ports. Besides, the monitor also supports a 3.5 millimeters mini-Jack port that acts as a PC audio input port, and an earphone jack port. Dell Ultrasharp U2715H is a 27-inch wide screen flat panel Liquid Crystal Display monitor that is incorporated with improved features which are up to date to enhance dual or multi-monitor utilization. The monitor is a Quad High Definition with a maximum screen resolution of 2560 by1440 pixels operating at a refresh rate of 60Hz, and a pixel pitch of 0.2331 millimeters. Moreover, the monitor has an ultra-thin bezel screen with an aspect ratio of 16:1, and a typical contrast ratio of 1000:1. The monitor comes along with an anti-glare hard coated 3H In-Plane Switching panel, which provides graphic designers with a wide 178 degree viewing angle. While operating in fast mode, the monitor performs at six millisecond response time, and eight milliseconds while working in normal mode. Additionally, the monitor also supports 16.78 Million colors, typically having a color gamut of 99 percent sRGB. The Dell Ultrasharp U2417H has ten input/output connectivity ports, that is, one version 1.2 DisplayPort, one Audio Line out, one Mini DisplayPort, five Universal Serial Bus (USB) 3.0 ports downstream, two HDMI/MHL connector, and one USB 3.0 port upstream. These ports are used by graphic designers to enable them to connect their secondary devices such as mobile phones in a way that is most suitable. 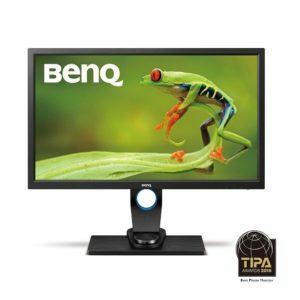 BenQ 27-inch IPS (SW2700PT) is a 27-inch ultra wide screen Quad High Definition LED monitor with an optical screen resolution of 2560 by 1440 pixels. The monitor has a maximum contrast ratio of 1000:1, and a refresh rate of 60 Hz. The display produces 1.07 Billion colors, supports an aspect ratio of 16:9, and covers 99 percent of the RGB Color Space by Adobe. This gives graphic designers a wide range of colors, and breathtaking colors display, making images appear in a more realistic way. The monitor’s color performance can be maintained and tuned with the utilization of a calibrator and a Palette Master Element. This gives graphic designers a professional display of their artworks with calibration. The monitor operates in a five millisecond response time, hence an increase in overall performance by the monitor and is equipped with the latest In-Plane Switching technology. This makes it possible for graphic designers to view their projects in a wide 178 degree angle, and with superb color accuracy. Also, the BenQs 27-inch IPS (SW2700PT) display also has an integrated USB 3.0 Hub, DVI-DL port, HDMI version 1.4 port, and DisplayPort version 1.2 connector. Samsung U28E590D is a full 28-inch High Definition monitor with LED screen lighting. Its 4K 3840 by 2160 pixels high screen resolution provides graphic designers with a viewing experience that is very immersive. Graphic designers can easily multitask on one screen by viewing two input sources at the same time. The Samsung U28E590D display has an aspect ratio of 16:9, and operates at a 60 Hz refresh rate to reduce input latency, image stutter, and picture tearing during graphics design. The Samsung U28E590D display has a static contrast ratio of 1000:1, and supports 1.07 billion colors. This makes the monitor deliver a nice grayscale, and offer a great color viewing of Ultra High Definition images in a stunning way. Graphic designers also enjoy color reproduction that is exact and increased brightness. Additionally, the monitor has a wide viewing angle of 170 degrees and supports a TN (Twisted Nematic) panel type. The Samsung U28E590D features advanced connections mainly, two different HDMI ports, and a DisplayPort version 1.2. These ports provide the graphic designer constant connectivity with the AV equipment and the PC, maximizing graphics design experience. The Dell S2240T is a 21.5-Inch sleek and stylish Full High Definition multi-touch display that provides graphic designers’ exceptional touch ability with outstanding clarity in an efficient, clean design. The monitor has a maximum screen resolution of 1920 by 1080 pixels, and a typical contrast ratio of 3000:1, and a maximum dynamic contrast of 8 million: 1. The monitor performs at a refresh rate of 60 Hz, and a response time of 8 milliseconds. Additionally, the monitor has an aspect ratio of 16:9, and a pitch pixel of 0.248 millimeters, which enables easy viewing of clear and bright images with stunning onscreen detail. The display supports a color depth of 16.7 million colors providing graphic designers with a superb color viewing of images that are of Ultra High Definition. The Dell S2240T LCD, includes in its design IPS (In-Plane-Switching) technology. This technology offers graphic designers a 178 degrees wide viewing angles and colors that are bold by letting more light to go through the IPS panel. The display has a typical brightness of 250 cd/m², and a color gamut of 84 percent. The monitor features input/output connectivity through the following ports: USB 3.0 port, USB upstream port, DVI-D, HDMI, or VGA ports. Finally, it all comes down to budget, if you want a decent computer monitor that can handle your graphic design work and satisfy your gaming needs. We have tried to cover the best computer monitors for graphic design and gaming for every price range. We hope our article was informative. Thank you for choosing us! Good luck with your purchase! Shop Smart! Previous articleSoundbar vs Home theater: what to buy?